Silver Somalian Elephant coins are among the most coveted by investors and collectors alike today. These coins combine .999 fine silver with a new design each year, driving increased interest on an annual basis. Available in both gold and silver, the Silver Somalian Elephant has been available the longest. 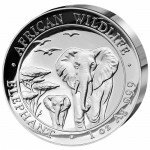 Silver.com currently offers the 2005 1 oz Silver Somalian Elephant Coin for purchase. Only 5,000 coins were minted! Ships in a protective plastic flip. Issued a face value of 1,000 Shillings (Somalia). Features unique design for 2005. During the first four years of production for the Silver Somalian Elephant, the Bavarian State Mint tightly controlled the mintage level of the coins. The coins were limited to 5,000 coins annually from 2004 to 2008. Beginning in 2009, the mint adopted a larger limit for these popular coins. 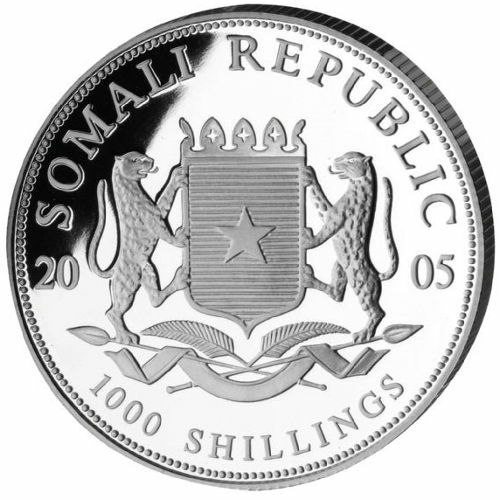 As 2005 production-year coins, these 1 oz Silver Somalian Elephants are rare for their one-year design and low mintage levels. As with all other coins in the series, the design featured on the reverse was used just once and not featured again on any future coin. Germany’s Bavarian State Mint was founded in 1158, making it the oldest operating facility in the country. It is one of the sovereign mints of Germany, and also produces Euro (€) coins and banknotes for use by all members of the Eurozone economy. If you have questions, Silver.com associates are waiting to help. You can reach us on the phone at 888-989-7223, chat with us online through our website’s live chat feature, or by submitting your questions in an email. If you are searching for similar coins, be sure to check out our collection of Silver Somalian Coins.